So, you’re wanting that perfect first dance for your wedding? At Kieran Clarke Entertainment, we feel that the first dance is the most important part of the evening and helps to build the atmosphere for a busy dance floor. Almost all the couples that book their wedding DJ hire with us are either worried they have chosen the wrong song or scared about being the center of attention. A common question we get asked is: “Can we invite our guests up to the dance floor after 30secs?”. This can put lots of pressure on your wedding photographer to get that special first dance picture & something you may regret. With Mr. popular Ed Sheeran topping the charts for the past 3 years, you can almost guarantee this guy will be in your top 3 wedding first dance songs. If a song means something to you both, or even if it’s just a song you both like, it really doesn’t matter what style you go for. All that matters is that you both like it :). You can now add lots of special effects to make your first dance that extra special without costing a fortune. 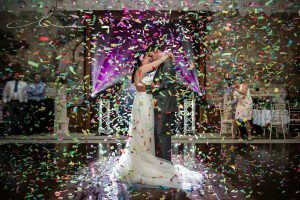 For a small cost, you can add a confetti cannon which, depending on the venue, can look very effective in pictures. You can even wow your guests with a layer of low fog called Dry ice. All of these pictures can be found on our website here. Take a look at this video clip below. This first dance stands out to me as one of my favourites.